The genesis of these priorities flow from varied conversations and requests from the constituents whom I am honored to represent. PEDESTRIAN SAFETY/ EXCESSIVE SPEEDING Pedestrian safety and excessive speed is the most requested issue to address. I requested the Town’s Growth Management Department to prepare the “Cotuit Village Pedestrian Safety Improvements Plan”. This was accomplished with several citizen-visioning sessions held at Freedom Hall. The final implementation is planned for 2016. Putnam Avenue safety and a meaningful pedestrian link to the ocean and village center continue to be a much sought after goal by the many residents of the Landfall, Presidents and Landsdowne neighborhoods. Growth Management is preparing a concept plan for citizen review and action. The upgrade and repair of two major private roads in Cotuit continue to top the list. Old King’s Road connects the Town of Mashpee to Barnstable and is off Main Street. Since navigational systems have become an auto accessory this “private” road is used to bypass Route 28 and Route 130 and all the tie-ups that that intersection endures. Nearby is Santuit Road that generates the most complaints as it connects public roads at either end and generates a considerable amount of daily vehicle trips. Like many other private roads throughout the town, Santuit is primarily dirt and it is uneven with ruts and puddles making it difficult to safely navigate. After a good rainstorm its runoff spills onto School Street requiring constant cleaning. These two private roads also are the only roads that connect into a major development, Kings Grant, where all the roads are public. It was very sad to hear that the Santuit River is devoid of the famed sea-run trout. This could be the result of several factors including the impaired water quality of the estuary where the trout feed. Another major priority is to look to partner with the State and Mashpee to have a review of the conditions affecting the river and create a program to alleviate the problem. Numerous requests have been received to have the Town follow the appropriate protocol with regards to the American Flag. If the flag is to be flown at all times it should be properly illuminated. A request has been submitted. A continuing priority is to ensure that the Town produces a Town wide plan for maintenance dredging throughout the waters surrounding our village. So much for escaping winter and having it quietly pass us by! As much as we could have done without Juno’s wrath, we were fortunate that most of us did not lose power, internet or phone service. The driving ban, implemented by the Governor was a great help in managing the blizzard of 2015 and with spring but forty-nine days away hopefully winter has lost its grip. In February the Cape Cod Commission will hold a two-day meeting continuing with the update of the Area Wide Water Quality Management Plan also called the 208. The primary focus of which is to address excessive nitrogen entering our embayments, will bring together the region’s policy makers in an effort to collaborate in local water quality planning. In my opinion, the single biggest issues that this summit will address are the costs and the revenue needed to protect and preserve our quality of life. Hopefully this effort will produce substantive results as much has been talked about for a long time and an argument can be made that it is time for action. Unfortunately, if we don’t move ahead we may well find the Federal Government forcing our hand. I welcome any input on this complicated and sensitive challenge. As the President of the Town Council it is my responsibility to vote on behalf of Barnstable with regards to resolutions proposed at the recent Massachusetts Municipal Association’s Annual Meeting. There three resolutions accepted were; investments in municipal capital projects that create economic growth and the protection of health & safety, ensuring strong partnership in FY 2016 and beyond between State Government and the Cities and Towns and a sustainable personnel management system to provide excellent services by prudent use of taxpayer dollars managed at the local level. This last resolution brings up the issue of what is called unfunded mandates. These are regulations that require the Town to provide goods and or services without having a revenue stream to cover them. For instance, a sizable obligation for a coastal community is the regulations on storm water systems. Barnstable is required to maintain over four thousand catch basins for storm-water run-off from roads at a cost in excess of $80,000 a year. For the Town to continue to maintain and provide these mandated services without adequate funding is unacceptable. We need to be clear with our Legislators that we cannot afford to accept these mandates without requisite funding. Deteriorating infrastructure continues to create enormous pressure on the local taxpayer. We can thank the newly elected Governor for releasing the entire $300 million dollars in Chapter 90 transportation aid funding. Barnstable’s increased share, in excess of a million dollars, will certainly help in addressing the numerous projects from road repair, equipment purchases, engineering services and even tree planting within our community. Focusing on Precinct 7, I would very much appreciate any citizen concerns regarding our Village. Every year the Town’s Department Heads do an onsite tour to identify and respond to safety and quality of life issues and the 2015 “List of Cotuit Concerns” is in the process of being drafted. I have my own list but welcome and need input from all. A major issue of pedestrian safety along our roads will have a follow up meeting in March or April at Freedom Hall. Planning efforts are underway for crosswalks and “traffic calming”. Draft regulations are in process by the Waterways Committee regarding the size and storage of vessels at Ropes beach. Simply put, there isn’t enough room for everyone to store any sized boat on the water’s edge. Let me know your thoughts. There is still time for public comment and suggestions regarding this issue. Soon, the many efforts, lead by Jaci Barton and her team from the Barnstable Land Trust will come before the Town Council for a vote on the appropriation of funds for the acquisition of land surrounding Lowell Park. The first reading, on February 5, will give the public notice of the project to protect the 19 acres and the second reading will be open for public comment. This preservation project is arguably one of the most important quality of life and environment acquisitions for the Village. I unequivocally support it and urge my fellow citizens to do the same. 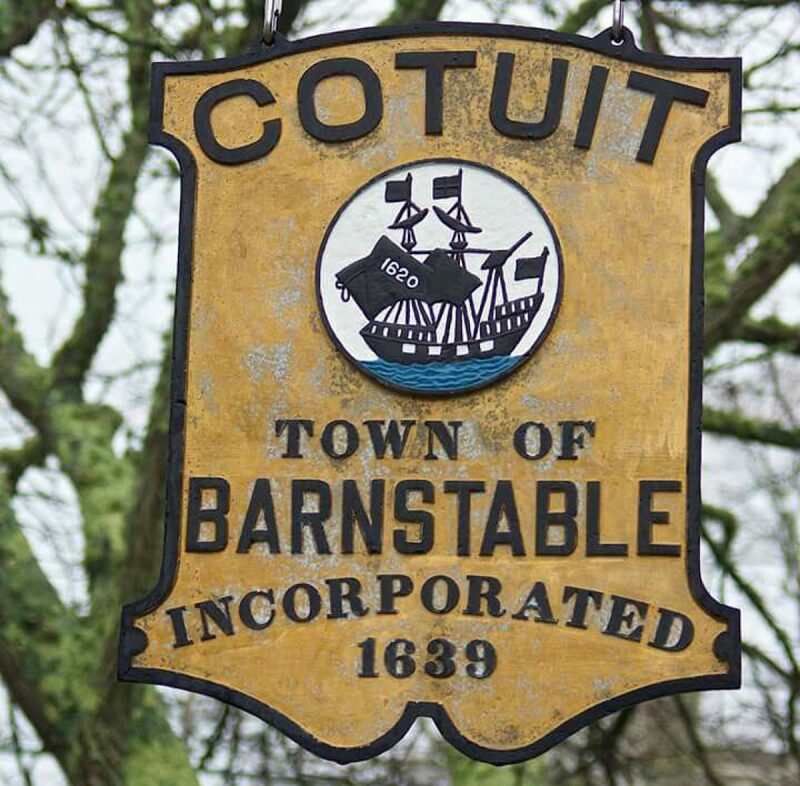 Please take the opportunity to stop by and discuss any Village or Town issue on the second Wednesday of every month from 3-5pm at the Cotuit Library. The next scheduled meeting is February 11. You may also reach me anytime at (508) 360-2504 or weekdays at Town Hall (508) 862-4738. Email Precinct7@comcast.net or for web updates and information follow me at www.BarnstablePrecinct7.com. I look forward to your questions and concerns and always welcome your suggestions and ideas! Be sure to check on your neighbors and friends and keep your pets safe too! Excessive speeding and pedestrian safety throughout the village of Cotuit was the topic of a recent village visioning session at Freedom Hall. Police Chief Paul MacDonald, Director of Growth Management, JoAnne Miller Buntich and DPW Engineer, Clay Schofield listened and responded to the full hall of passionate pleas from residents concerned over the habitual violations of posted speed limits and the safety of pedestrians along our streets. Once again Putnam Avenue was discussed as the cars travel at such a high rate of speed creating a pedestrian safety risk. Maps were displayed and citizens marked up and identified specific areas of concern and provided valuable input. Following that meeting I met with Town Staff to walk, photograph and discuss in further detail these areas. Once Staff has had the opportunity to survey and outline possible solutions, a second session will be scheduled to detail recommendations. Now that the Town of Barnstable has settled on a ten-year contract to haul our trash from the Transfer Station it is time to revisit the recycling component of that enterprise. Realizing that one shouldn’t operate in isolation and wanting to learn as much as possible on the subject, I have paid close attention to our neighboring communities and to the often passionate debate over the methods of trash disposal. At this past summer’s solid waste workshop, Dan Santos, Director of DPW, briefed the Council on the selection of the contractor, New Bedford Waste Services and its partner ABC Disposal Services and how the newly negotiated contract will impact the Transfer Station fees. Where it was once anticipated that the sticker price, currently $160 per year, was going to double or perhaps triple, Mr. Santos assured us that that was not the case and most likely we would see only a modest increase in 2015. He also spoke to the recycling component of the station and though he proposed no changes at that time he did represent that a change from multi-stream recycling (separating plastic, metal, paper and glass into four separate containers) to a single stream process might be recommended in the future. This makes sense as under the new contract, recyclables are not figured into the tonnage costs and will be hauled away at no cost to the Town. In essence the Town already has a pay as you throw PAYT method in that residents and residential property owners making individual trips to the Transfer Station are allowed up to 8 bags (30 gallon each) limit for $15.00 per entry with $1 per bag over the limit without having to purchase an annual sticker. In the new year Barnstable residents and property owners that currently use the Transfer Station to recycle only will be required to sign up for a zero cost sticker and “free” recycling will no longer be available for non-residents. This will allow for more accurate recycling data collection and Barnstable will no longer be subsidizing other communities. In theory everyone who disposes trash should be recycling to comply with the State waste ban regulation that prohibits recyclables from the waste stream. Seventy-five thousand dollars has been appropriated in FY15 for the study and improvements to the Transfer Station with particular emphasis on improving the traffic flow and to prevent the numerous near misses and fender benders that currently occur due to the less than efficient traffic patterns. Solid waste disposal and recycling begs many questions that need to be answered definitively by the Town Manager and his Staff. Should the current system at the Transfer Station be changed to a PAYT model? Should the Town consider Town-wide curbside trash pick-up and recycling? A ban on Styrofoam, plastic bags and containers? Mandate that trash haulers who operate in Barnstable provide recycling? Should multi-family facilities be required to recycle? Should the Town have a comprehensive policy regarding the disposing of all trash and recyclables rather than a piecemeal approach? The Council will be looking for the recommendations along with the honest math that gives true costs associated with implementing any significant changes, including the benefit savings to the residents in energy, time and money. Regardless of what happens, efforts need to be made to develop public education campaigns that promote waste reduction in both the private and local business sectors. It has been interesting to follow the Town of Mashpee’s misstep with the issue of PAYT or Save Money And Reduce Trash (SMART) and how the citizens felt excluded from the choice to change. Please take the opportunity to stop by and discuss any Village or Town issue on the second Wednesday of every month from 3-5pm at the Cotuit Library. The next scheduled meeting is November 12. I am also available at (508) 360-2504 (cell) or weekdays at Town Hall 8:30-3:30 (508) 862-4738, Email Precinct7@comcast.net or for web updates and information follow me at www.BarnstablePrecinct7.com. I welcome your questions and concerns and look forward to hearing from you. According to the Town Charter the Council’s summer meetings are reduced to one in July and August allowing time for family and vacationing. However, preparing for the future business of the Council will be my focus in the upcoming months. The Council will soon be required to set in motion the process of selecting a new Town Manager. This process is arguably one of the most important and time-consuming functions of this elected body. Towards that end, I will be establishing a committee to review and update the Town Manager’s job description, an integral part of the selection process and one that is long overdue. Further, the committee will also create a timeline for the selection process to begin; such that an orderly transition can occur in July of 2016. It is imperative that meaningful dialogue and broad based citizen input be part of our Town Manager search and selection. A televised workshop on recycling and trash has been set for July 24th, 6pm. At that time the Staff will give their recommendations to increase recycling and reduce trash. The Citizen’s Financial Advisory Committee will be updating the math associated with recycling and the Town’s Renewable Energy Commission will have an opportunity to share their recommendations as well. We will learn of the costs associated with any proposed programmatic changes at the Transfer Station, and to changes to the hauler regulations. A “Pay as You Throw” scenario would affect only one-third of the residents as the remaining two-thirds use private haulers. This is a significant issue in that haulers are not regulated with regards to recycling and currently there is no accounting as to whether or not recycling is occurring. Many Councilors are of the feeling that this issue has to be resolved as part of a global trash solution. I welcome any and all public input on this matter, as currently there has been little or no support from my Precinct for “Pay as You Throw”. Taking into account that a negotiated contract to haul the Transfer Station’s waste and recyclables is about to be executed there are many moving parts to the “trash talk” and we will have important decisions to make. Along with our two regular meetings on the 4th and 18th of September the full Council will participate in a half-day strategic planning session led by an independent facilitator. This worthwhile brainstorming retreat will afford the Council the opportunity to develop and clarify priorities and objectives with a focus on constituent feedback in establishing the future direction of the Town of Barnstable. Please take the opportunity to stop by and discuss any Village or Town issue on the second Wednesday of every month from 3-5pm at the Cotuit Library. The next scheduled meeting is August 13. I can be reached at my cell (508)360-2504 or the Town Council office, (508)862-4738. Email Precinct7@comcast.net or follow my blog at http://www.BarnstablePrecinct7.com for updated information. I welcome your questions and concerns and look forward to hearing from you. Your Town Councilor, Jessica. This Memorial Day it was a great honor to walk in the Centerville Parade. What a grand tradition of remembering our soldiers and families by coming together to march as a community. We enjoyed the sounds of the BHS Band, bugles, soulful bagpipes and drums as we marched from the South Congregational Church with a stop at Monument Square to pledge allegiance and reflect, and ended at the Old Beechwood Cemetery. I was moved by the decorated and uniformed Veterans, Police and Boy and Girl Scouts who ceremoniously lead us in paying tribute to our unsung and decorated heroes with reverence and respect for the American Flag code. The costumed Colonialist women and Military Minutemen also marched and would periodically pause to fire off a traditional musket salute paying homage to the brave soldiers who made the supreme sacrifice at the birth of our great nation. This wonderful parade filled with friends and families, provides us with a meaningful tradition to remember because we must never forget. Ropes Beach and the Boat Ramp is the area in Cotuit receiving the most complaints over pedestrian and vehicular safety and accessibility. Especially during peak season, the congestion along this narrow way has resulted in frequent accidents and causes spirited competition for the few available parking spots. Last season a change in the location of permissible trailer parking allowed for some relief, however, the boat ramp and the road area directly above the ramp remains a challenge. Recently the Town’s Engineer, Roger Parsons, spoke at a Civic Association meeting and stated that Old Shore Road is barely wide enough for a one way let alone a two way road with one side of parking. To seek relief, he and the Department of Public Works Director, Dan Santos, recommended that the road be turned into a one-way. On May 12, the Town Manager approved the change and signed the paperwork necessary to make Old Shore Road in Cotuit a one-way. On May 16 the change or amendment to the Town of Barnstable Traffic, Pedestrian and Tow-Away Zone Regulations was legally advertised and the DPW instructed to adjust all existing signage to reflect this significant change. Keeping on Old Shore Road, the Harbormaster recently applied warning stickers on all of the non-permitted “structures” erected on the beach used for vessel storage and on Tuesday the Waterways Committee discussed a timeline and plan to address the in-season boat storage on Town Property. The Committee will be coming up with a recommendation on how to keep in check the ever growing number of “vessels” that appear along this small stretch of grassy beach after April 15. There have been lots of suggestions from limiting the size of vessels to installing a temporary dingy dock. Whatever is decided, I’m sure this topic will continue to spark fervent discussion and debate. With the exception of the Town Council’s first scheduled meeting of 2014, which was cancelled due to a Nor’easter, the Council has conducted ten regular meetings, a trash hauler workshop, several executive sessions and numerous adhoc and sub-committee meetings. April and May included approving a $15.2 million capital improvement budget for FY’15, the first of a five-year $129 million budget plan that will focus on improving our current infrastructure. In the next few weeks the Council will be presented with an operating budget in excess of $160 million dollars that will require approval by the current fiscal year’s end, June 30. It’s an honor to continue to serve alongside my fellow Councilors who are committed to the duties and responsibilities of their Town and respective Precincts. Together we have questioned, held thoughtful debate and most importantly, strived to create an atmosphere where the Citizens play a more meaningful role in Town governance. Please take the opportunity to stop by and discuss any Village or Town issue with me at the Cotuit Library on the second Wednesday of every month from 3-5pm, with no appointment necessary. The next scheduled meeting is June 11 or you may reach me at 508-360-2504 or the Town Council office, 508-862-4738. My email is Precinct7@comcast.net or you may follow my blog at http://www.BarnstablePrecinct7.com for updated information. I welcome your questions and concerns and look forward to hearing from you. Your Town Councilor, Jessica. Red sky in the morning sailors take warning of yet another named storm. It was about a month ago when Hercules blew into our Town causing coastal flooding and erosion and now on the heels of Quintus, which dumped over a foot of heavy wet snow, Rex paid us a soggy visit. Seneca is next on the named storm list and with only four weeks of winter remaining here’s to hoping we don’t receive a visit from Zephyr. About the only good thing to say about all of the snow is that the children and a few adults have enjoyed the great sledding conditions at Barn Hill at the Cotuit Highground Golf Course! Many calls were received from residents concerned over the timing of removal of snow from our sidewalks. According to the Town of Barnstable’s Snow and Ice Policy, sidewalks, in general, are undertaken after the road plowing has been completed. The Town is required to begin sidewalk clearing no later than 48 hours after the conclusion of a storm. The sidewalks along the Hyannis and Osterville Main Streets are an exception in that they are cleared concurrent with plowing, due to their high-traffic business districts. All other sidewalks are cleared during the same timeframe. In other words, no Village is done before another; they each have individual contractors and the sidewalks in Cotuit, Hyannisport, and Barnstable Village, etc. are all cleared at the same time. If you have specific concerns or complaints about snow or ice removal in your neighborhood call Barnstable Department of Public Works snow line 508-790-6331. Those of us not on Town sewer are mindful of the stress that is put on our on-site septic systems, from clothes and dishwashers to lengthy teenage showers. We abide by the old adage: If it’s yellow let is mellow, if it’s brown flush it down. According to the Cape Cod Commission’s website, wastewater management is one of the most significant regional concerns affecting Cape Cod. About 85 percent of the wastewater flow from homes and businesses on the Cape use individual on-site septic systems that drain directly into the groundwater, running underground through watersheds to our coastal areas. In many watersheds, coastal water quality has become impaired. On January 30, 2013, the Department of Environmental Protection directed the Cape Cod Commission to prepare an update of the 1978 208 Section Plan to address the critical degradation of Cape Cod’s water resources. Over the last year, the challenge has been to integrate the large amount of information into a stakeholder driven process that will ultimately produce a feasible, affordable plan with the specificity warranted by the amount of information and work done over the past 35 years. Through the development of a Regional Wastewater Management Plan and an update to the Section 208 Area-wide Water Quality Management Plan, the Cape Cod Commission is introducing residents and policy makers to the science, challenges, and the potential solutions for managing wastewater in an efficient and cost-effective way. The Commission has been invited to the February 27th Town Council meeting to brief the public on the continuing efforts to address this critical concern. During these gray days many people can suffer from the blues. Seasonal affective disorder (SAD) is a type of depression that can occur in the winter. It’s cold, there’s snow and ice preventing us from taking our daily outdoor constitution and the sun has gone south. Some suggestions for coping with this form of seasonal lethargy are getting out in the open air for half an hour every morning where the natural light will help with keeping the body clock in check. Try to get to the gym or take a swim both of which helps to increase serotonin levels that can affect mood. And maybe those Valentine chocolates, in moderation, are a good thing as research has shown that people who suffer the winter blues often crave a natural amino acid called tryptophan, contained in some foods, including chocolate. Tryptophan is involved in the manufacture of the feel-good hormone serotonin, which the body produces when exposed to sunshine. If you are struggling with the blues make sure you seek professional help. I’ll be looking for the early signs of spring in the green shoots of snowdrops and the purple finches singing their mating songs. Hope springs eternal! Two Thousand Fourteen is an extremely significant and meaningful year for the Town of Barnstable. Throughout the coming months each of the Seven Villages will distinctively honor the 375th year of the Town’s founding. Historical chronicles, interviews and themed celebrations will be showcased with a special emphasis on the past twenty-five years. Events of triumph, tragedy and tradition will be recalled, as there is much to reflect upon and remember. A calendar of events and more information can be found at http://www.Barnstable375.com. A major change in the past twenty-five years was the transition from a three Selectman-Town Meeting form of governing to the current Town Council-Manager structure. Barnstable adopted, in the spring of 1989, a Home Rule Charter that vested authority in a Town Manager subject to the legislative decisions of elected Town Councilors. While we may miss the open debate, candor and free association of Town Meeting the less provincial and more streamlined method of conducting the people’s business is deemed more productive and efficient. I am deeply honored and humbled to serve as Council President. One of my first actions will be to create an online public comment procedure that will allow citizens to submit comments directly to the Council on particular agenda items. Further, I have completed Councilor Liaison assignments to the various boards, committees and commissions. The Appointments Committee, which is a standing committee, shall be brought to the full council as a resolve to be voted on by the entire body at our first meeting this year. Ad hoc committees will also be formed to review Town Council Rules, Compensation and Town Manager performance. A Private Roads Committee will be resurrected to thoroughly examine the complex and costly challenge of repair, upgrade and taking of privately owned roads. No other issue has lodged more comments and complaints than that of public and private roads. With nearly 500 miles of roads; 271 public and the remaining privately owned, this issue is certainly a challenge and the committee will need to wrestle with the dilemma of how to best balance the competing requests for improvements with the realities of a finite budget. There is a lot to undertake in the next year but I’m excited by the challenge. I look forward to working side by side with my fellow councilors to do our best to preserve and enhance our natural resources, continue to advocate for neighborhood safety and a sustainable local economy, all the while encouraging civic engagement and a strong sense of community. Let’s make 2014 a year to remember! Please take the opportunity to stop by and discuss any Village or Town issue with me at the Cotuit Library on the second Wednesday of every month from 3-5pm; no appointment is necessary. The next scheduled meeting is January 8th. If you cannot make my meeting I can always be reached at 508-360-2504, through the Town Council office at 508-862-4738 or via email Precinct7@comcast.net. I look forward to hearing from you.